Kris W. asks: What is it in seaweed that is used in making ice cream? Seaweed didn’t exactly come into play during those “make your own ice cream” science experiments you probably did in elementary school, but it is sometimes used in the making of commercial ice cream. No, it isn’t just in seaweed-flavoured ice cream, either. Seaweed is actually used as a type of thickening agent for ice cream. 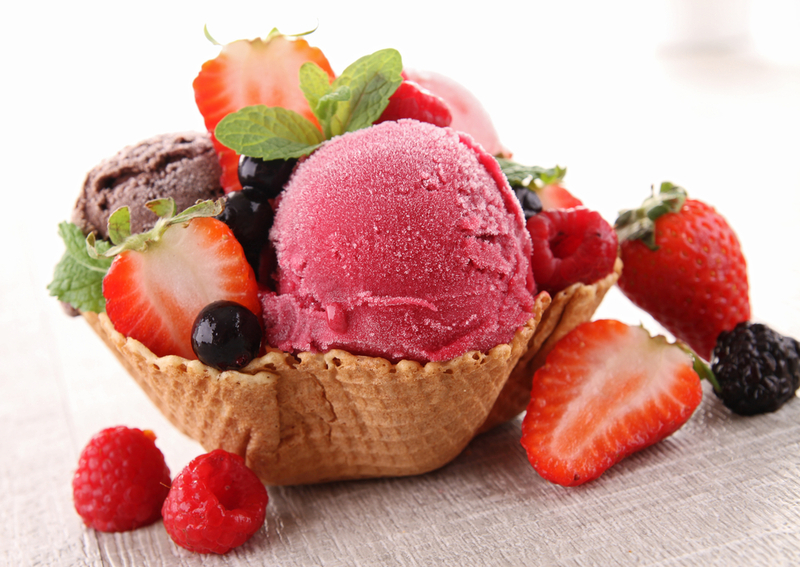 Technically, the substance usually used to thicken the ice cream is called “agar” or “agar-agar.” The name comes from the Japanese word for “red algae.” It was discovered in 1658 by Minora Tarazaemon, a Japanese innkeeper who supposedly left extra seaweed soup outside overnight. It was winter, and the substance froze. Tarazaemon noticed in the morning that it had turned into a sort of gel when it thawed again. Whether that’s exactly how Tarazaemon discovered it or not, it was later found that after first boiling seaweed, repeated thawing and freezing makes a pure, gelatinous substance perfect to use as a thickening agent. It’s likely that the process was picked up by the Dutch in the 17th century and later spread to other East Indies ports. But you make homemade ice cream with just milk, sugar, and a bag full of ice and salt—so why is a binding agent needed in the production of commercial ice cream? The basic components of ice cream are fat (usually from milk), sweeteners, air, ice crystals, and “other solids” which includes non-fat milk solids and various flavours (like bits of cookie). When the ice cream liquid is prepared, often an emulsifier and stabilizer must be added to keep all the ingredients together and improve the texture. That’s where the seaweed comes into play. Most commercial stabilizers these days are vegetable gums—that means agar, carrageenan, or something like Xanthan gum (derived from bacteria found in cabbage). These stabilizers keep ice crystal growth small by immobilizing the liquid in the ice cream—sort of by acting like a sponge. Larger ice crystals, caused by too much liquid in the ice cream, will make the ice cream feel grainy if a stabilizer is not used. The stabilizers also help keep the ice cream from melting too quickly so that you can enjoy your ice cream for a longer amount of time on a hot day. That said, more stabilizers do not equal higher quality ice cream. Quality ice cream typically contains more fat and less air, while lower quality ice cream substitutes a higher quantity of stabilizers for fat, and often contains more air molecules. Ice cream isn’t the only place you’ll find seaweed in your kitchen. Other items containing agar or carrageenan include salad dressing and jelly. It can even be found in some beers. You might also find it in your toothpaste—never thought you’d be brushing your teeth with seaweed, did you? If you’ve ever had braces, you might have tasted a type of seaweed powder. That yucky, almost doughy-tasting gook they put in metal trays to make impressions of your teeth is usually made with alginate powder, derived from seaweed. In Japan, agar-agar is a popular bulking agent called Kanten. There is even a “Kanten diet.” Agar is roughly 80% fiber and has barely any calories, so it’s considered somewhat “healthy” by some. If you’re trying to lose weight, though, I don’t think eating ice cream with agar in it is going to help you. Agar isn’t just used in food production; it also has uses in microbiology. Agar provides a solid surface to aid in the growth of fungi and bacteria. The gel won’t be destroyed because many microorganisms can’t digest agar. The method was first used by a laboratory assistant of Robert Koch, who saw his wife using agar to make confectionery jelly in the kitchen. Koch believed that agar had potential in the laboratory and ended up using agar to make the first culture of tuberculosis bacillus. Agar also allows for seedling germination in petri dishes, provided the seeds have been sterilized. You might also find seaweed in children’s modelling clay. Some studies have shown that carrageenan might be able to protect you from some STDs, but we don’t recommend you pig out on ice cream and put the theory to the test. This statement deserves its own article. There’s a pseudoscientific idea that the body contains “toxins” (what these toxins are is never specified) and that eating, applying, or otherwise doing certain things will draw these toxins out. This idea needs to be researched, I think. I want to do a Biology report on agar from production to use in ice cream only. What were your resources and do you know of any books that talk about this?